When purchasing a printer for commercial applications, it can be inviting to jump straight to a multi-channel printer. However, these printers simply aren’t necessay for a number of applications. Before buying a printer, consider your specific needs. You don’t need a printer with more colors to print portraits or pictures with a narrow color gamut. Getting more than you need will only lead to trouble. We’ve seen folks with clogged channels in their multi-channel printers because many of their prints don’t utilize those channels. 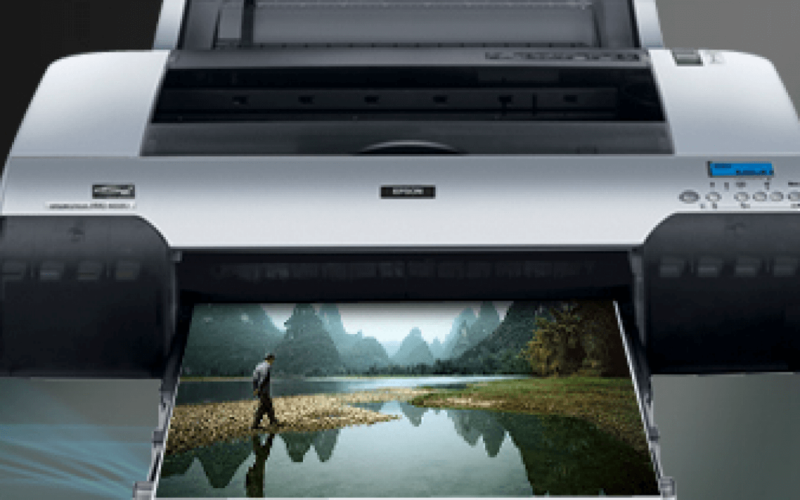 The Epson 4800 uses the same head as the 7800/9800 printers. This printer uses the the DX5 8-Color Piezo Head. It is considered to have been improved by Epson’s new advanced MicroPiezo TFP head technology which is in the latest printers—the 4900 and 9900, as well as the 79/99 and 7890. We’ve had great luck with the DX5 head in our 7800/9800 printers. It just keeps working. It handles almost any inkjet ink formula with ease. It recovers from clogs well. It prints great whether you’re using pigment, dye, or sublimation inks. It even handles third party inks with ease. With this head, the 4800 series should both be reliable and produce beautiful results. Ink cartridges are not pressurized and maintain excellent flow. The printer is easy to repair using the available wizard and parts are low cost. These printer works well and will last a long time. This is an 8-color printer with no slot for an extra black. If you want to swap between matte and gloss, you’ll have to perform a full change over. The Epson 4880 is basically like the 4800 with the exception of a next generation head with a coated bottom. It is more sensitive than the DX5 head, but still costs less than $400. The 4800 repair wizard is not available to the user. Check with us if you need repair help. American Inkjet Series highly recommends these printers. They are worth their price and highly versatile, useful for sublimation ink as well as any water based ink.